How can we use the Internet to spread the Gospel of Christ? Bill Salus: Maybe for those who would like to get their foot in the door on something like Web Ministry, speak to them for a moment before we get more into some of the prophecy stuff. Nathan Jones: There is a lot of fear especially among the older generation who wouldn't have grown up with technology that the technology of today is just beyond them. They conclude that they just can't use it or figure it out. But, there are many mature folks I know of who use it just fine. Now cost-wise, technologies like Facebook and Twitter cost either next to nothing or are free. It's all free stuff! Websites are real cheap and really you can even set up a website now that doesn't require a lot of programming knowledge. You can also produce e-newsletters using a WYSIWYG editor, meaning "what you see is what you get." I know some of the other Bible prophecy ministers are starting to use them to get their newsletter out. Technology isn't all like it was back when I started as a Web developer over 10 years ago when you had to understand the code. Now it's a lot easier for people. Bill, you yourself have got all those blogs and websites and you are doing a great job with them. There is just no excuse for getting online and sharing the Gospel, even if you don't want to post your own material. I have people all the time from our Facebook group and on the blog who do nothing but go to different online forums and share the Gospel with people. One of our best volunteers lives down in Florida, is a grandmother, and she is a gun nut, if I can use that term affectionately. She is on all the gun nut sites. She shares the Gospel with people wherever online she can. I am amazed when I look at the statistics of our website and sometimes see visiting websites that are totally against what we stand for. There was a lesbian group for instance that had an issue with one of our articles on homosexuality. The site owner goes ahead and posts our beliefs on the topic based on what the Bible says about homosexuality on her website, and in response her people stampede onto our website to read all about it. Well, I don't know if she realized it or not, but she just opened the door of the Gospel to all her readership. That is the power of the web! Everyone can have access to the Gospel. All you have to do is like what you would do when you share your faith with your neighbor next door or your family. You can just get right online and do the same thing. Bill Salus: Great! A lot of the articles that we find coming out on various blogs give you the opportunity to make a comment. It is the perfect opportunity to express your faith on some level depending on what the article is about. I encourage people to use these opportunities. Bill Salus: Gutenberg came out with his printing press around the 1600's or whatnot and it revolutionized the ability to get the Bible into different languages and to get more scriptural information into people's hands. In these days, there are Bible software programs. I will be honest with you and I am guilty of this and I almost hate to admit it, but I seldom even open my paper Bible. I am always opening my Bible on my computer. Nathan Jones: The search features are just so wonderful to use when studying with an online Bible. Bill Salus: When I study, I study in my Parson's Bible Software. There is Logo's Bible Software. What software do you folks use over there at Lamb & Lion? Nathan Jones: I prefer Biblegateway.com. It's software is on a website. You can get on with any Internet connection and Web browser and do searches by topic and keywords. It allows you to pull up specific verses. It's got all sorts of different versions as well as commentaries built into it, and it's all online. It's all free. They just ask for a donation now and then if you're interested. Other online Bibles are the Blue Letter Bible and Bible.org. Bill Salus: So, you don't even have to buy software. You prefer to use Web driven sites that are free to go to? Nathan Jones: It's my left hand. My right hand is probably dictionary.com to correct all my spelling! So, between those two I study the Bible and help people answer their questions. I teach Bible Drill to fourth and fifth graders and so I've learned to ability to look up a verse in under 10 seconds like the best of those kids, so I'm not worried about losing the ability to find references in the Bible. The technology is out there so anybody can access the Bible. Having Bible's online are so wonderful because they open up the Bible to the entire planet. Places where Bibles are illegal like North Korea, well now through the Internet they can access them and most of those sites are not blocked from what I understand. Even North Koreans can get to some of those websites. Bill Salus: It would be very difficult to censor all Bible-related websites without totally cutting off the Internet access, so it does reach the unreachable places. Wasn't the ministry of reconciliation to get out from Jerusalem and go to the outermost parts of the world? That is our job as Christians. Nathan Jones: I firmly believe we will not reach the entire world with the Gospel over the Internet at this time period. We do know from the Bible that once the world is in the Tribulation it talks about the Two Witnesses in Jerusalem, the 144,000 Jewish evangelist, and an angel that travels all over the world. And so, the fulfillment of when Jesus says that every nation, tribe and tongue will get the Gospel is Tribulation oriented. Still, we can get really close nowadays. Again, though, the Web does have it's limits, because we only have only about a third of the world population accessing the Internet right now according to the latest statistics. So, that still leaves two-thirds of the world who aren't using it yet like your aborigines and your tribes people. I'm not saying the Web should replace missions work, but it is a tool within God's tool belt that He's using really mightily right now to get the Gospel out. 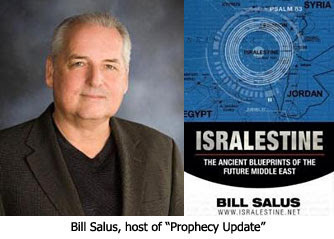 In the next segment of this interview with Bill Salus concerning Bible prophecy and technology, we'll look at the source from where our technology flows. While the Internet is one tool that can be used to spread the Gospel, I am of the opinion that the Internet has been more successful at spreading filth, lies and evil. The Internet is more of a curse than a blessing in my opinion. My hubby would agree with you. He hates 'Facebook' because of the malicious gossip and mischief-making he hears about so often. Because I am unable to convince him about the advantages, I avoid it at present. It took him a long time to trust the blog. At one time, I am embarrassed to say, he thought I was having a 'cyber affair'. He didn't know how, but he just heard of some nasty goings on and feared the worst. So I tread extra carefully for his sake, plus my own stupidity with all things electronic. I had a message from AVG last night which said it had blocked 313 threats to my identity with ‘suspicious processes’? I can only think it is to do with You Tube as I rarely use email, and never do official business like banking. That has unsettled me; I really don’t like the sound of that at all. Non-the-less, I am carrying on. Yes I lived ok without the internet; but with its help I ran here to Nathan for support with my family upset. I have no sound churches in my area; there is one that was Brethren and good Bible teachers on the whole, but are now part of the Evangelical Alliance (Ecumenical) and they do not accept the gifts of the Holy Spirit for today, which I find demoralising – so I go nowhere – for years! The internet has allowed me the teaching and fellowship I would normally be without. Plus the distancing I personally need when I am unsure of ‘things’. The Lord has also used me from time to time, albeit in small ways, which is encouraging. I am not a ‘talker’; I am better suited to writing; so all told the internet has genuinely benefitted me. What is the 'Bible Drill'? One great thing about the Internet (though I stand by my original post) is getting to "meet" people like you. Some day in the next life we will get to meet face to face - I look forward to that! Sure, the Internet has it's dark side, but hey, what on this earth doesn't, right? Agree, the benefit is that I've been blessed getting to know you all, something that never would have happenend without the Internet. Sue, Bible Bowl/Drill is a 4th/5th grade series of competitions where the kids have to memorize 25 pre-selected verses, 10 key passages, and be able to look up any book in the Bible under 10 seconds and identify the book before and after. If the program was a requirement in every church, we wouldn't see anywhere near the apostasy we have in churches today. I seriously doubt--no, I KNOW--that memorizing scriptures, knowing the addresses of passages and what page books in the Bible are located on will help our apostasy situation. It's the meat of the Word that's missing in churches--not the semantics of where things are and a few memorized words! I'm sorry Laura, but that sounds like putting the cart before the horse to me. First erect the solid foundations at the first shaky steps in the milk department will give opportunity to become a runner of the race for a crown at the Bema. Take the meat of the word into Emergent and they would vomit it back up again - digestive tract immature and no stomach for it I fear. For the past several weeks I have been pondering about Matt24:29, that Posties claim to be the Rapture, and also claiming that 1Thess 4:16, a Rapture passage; compliments it. I do realise that from the grammatical standpoint, the tenses (and other factors) rubbishes that notion entirely; but I still wondered why Posties get it so wrong. Last night, to my complete surprise, a thought popped into my head that also discounts any notion whatsoever that Matt24:29 has anything at all to do with the Rapture of the Church. “Matt 24:29 is NOT a ‘mystery’ as vs 29, and preceding verses, are all based upon what is already revealed in the O.T. Vs 29 is a mix of around three O.T. passages (at least). Remembering a ‘mystery’ is not a ‘who-done-it’ to try and solve, but rather a truth that is NOT revealed in the O.T., but new doctrine revealed in the N.T. Paul was given the revelation of both the Church and the Rapture; the ‘12’ had no idea in Acts 1 that the ‘church’ Jesus had said He would build, concerned an ecclesia/gathering of not only Jews, but also Gentiles. Postie Bob M likes to insert into the text that Jesus had told his ‘closest’ best friends’ all about the mystery of the Church. Yet in Acts 1:6 these ‘best friends’ asked Jesus if He was about to restore ‘the Kingdom’ at that time, which refers to the physical, earthly Kingdom in the land of Israel with Jesus ruling as Messiah’. Proof is also evident within Acts that they were all taken by surprise by this ‘Mystery Church’. In vs7; Jesus had plainly told them it wasn’t for them to know. As we now know, Jesus called Saul, a man very well versed in the O.T., to be the Apostle Paul who would give them the revelation of the Mystery Church and Mystery Rapture. Just as John alone was chosen to divulge THE Revelation to the Apostles and Church. What do you think; have I made myself clear or am I off track??????? You and I mostly tend to disagree but see eye to eye on a few things. I agree with you saying "It's the meat of the Word that's missing in churches--not the semantics of where things are and a few memorized words!" Every kid memorizes the Pledge of Allegiance to the Flag of the U.S. But how many just say it like robots every morning in school (I hope they still say it) withouth giving any thought to the meaning to the words? I was one of those robots until one day in school we watched a film that examined the meaning of the Plege of Allegiance word for word. After that the Pledge actually MEANT something to me! I'll alter Laura's comment to the familiar phrase "Where's the beef?" Memorization and competition is mostly just a big bun. Laura and Billy, I can't disagree with you enough (in brotherly love of course) about the importance of building a firm foundation in Bible memorization. How many times in our lives have verses we've memorized as children like John 3:16 and Luke 11:9 popped into our head at times we've really needed them? How often did we need to know where to find the Sermon on the Mount or which chapter of John is about the crucifixion when sharing our faith? How important was it to our own faith to know the Bible is more than one book, but 66 books written over 2,000 years yet unified in theme and purpose? These are the very foundations of our faith, and THAT is what is lacking in the churches today. We've built our houses on "missional" sand, instead of the rock of God's Word. Excellent point, Sue! We who have the full revelation tend to forget that the biblical authors only had partial revelation in respect to the time in which God imparted them with that new knowledge. Even John was limited by his ability to understand what he saw in the future. I don't see either how Post-Tribs could say Matt. 24:30-31 is about the Rapture. It doesn't match other accounts that include the dead in Christ rising. Also in Matthew the nations mourn knowing judgment is upon them, whereas the Rapture verses show the Rapture to be a complete surprise resulting in delusions concerning it and scoffing. Person A has an understanding of the Word*; a belief in the Word; and faith in the Word. Person A can ONLY be a Christian. Person B has memorized the names of the Bible Books; can quote complete verses; knows what hamartiology or soteriology are; and can find a verse in 15 seconds. Person B can be a Christian OR they can be an atheist, a Jew, a secular historian, a Muslim, an agnostic or even a computer program! Memorization and knowledge (not the same as understanding) is NOT a good foundation. The foundation must be understanding, belief and faith THEN and ONLY THEN will memorization and knowledge will be valuable. It guts me to realise I failed my boys by not encouraging them to memorise verses. I was so very busy that I assumed too much – that their then Christian School and ‘Crusaders’ were teaching them properly. I did checks, but obviously not thoroughly enough. When I taught S.S. we just had a book to follow which I enjoyed theatrically embellishing; and loved the wide eyed wonder on little faces. I now wonder what in the blue blazes I did teach them of any use? One of the last decent conversations I had with my youngest so, aged around 17, I told him ‘whatever else you do, make sure you trust The Holy Spirit to lead you into His Truth in The Word’. Now ‘emergent’ he told me (a year or so ago) that he remembered I had told him to trust the Holy Spirit – full stop, that was it! He said ‘no one can know the truth’. When I told him ‘ Jesus is the Way, the Truth and the Life’, he insisted that was MY interpretation…gasp splutter! ‘No it isn’t’ I retorted ‘it’s not my opinion at all’. So he asked me whose opinion it was? I replied ‘its God’s opinion’ he just looked at me blankly. To ‘disciple’ someone includes ‘discipline’. I obviously didn’t do that properly. Now my son should be on the ‘meat’ of the word, but he isn’t even drinking the milk; he is into the equivalent of ‘fast junk food’ full of hydrogenated fats and sugars minus nutrients. When I gave him a small slice of ‘meat’ he choked on it. I am sad to say that he is Biblically illiterate, and so is his ‘pastor/governor’ or whatever they call them now? Praise The Lord Nathan that you are building strong ‘bones and teeth’, a healthy skeleton that will provide a framework for muscles and healthy flesh. It’s what is essential when starting into life’s ‘marathon’. These ‘emergents’ will end up with spiritual rickets when/if they come to themselves and return to the Father. God bless you in this vital work. I don’t disagree with your analysis in relation to ‘coming to faith’ (justification). Billy, certainly it's pointless to have all that Bible knowledge and never respond to it in faith. The point is, is that the Bible knowledge is there when they are ready to come to faith. Or, if they're already saved, as Sue said, they'll grow faster in that faith. Sue, you're too hard on yourself. Don't forget that it is the work of the Holy Spirit, not the Mum, to bring a person to Christ. Jesus hasn't given up on your son. He may just have a different timing for his true conversion than you do. Heaven forbid it be post Rapture, but he may remember the foundation his Mum left him and lead many to Christ during that time. With the Lord there's always hope. "I'm sure the Post-Tribs will miraculously pop in here to bless us with their insight into the subject. How they find out as soon as we post the word "Rapture" is beyond my technical knowledge. :)"
Maybe you have a pre-trib tracking cookie planted here. Funny thing is that I didn’t get too many comments but every time I posted something on the rapture or used the word tribulation, some postie would comment. It was as if they sat there every day googling the word rapture and pre-trib just so that they could go on the attack. I was initially intimidated but then I discovered that whenever I seriously challenged them they backed off. The process helped me learn and further convict my suspicions that pre-trib mockers do so for other than biblical reasons. Truthfully Prets, Posties, Mids and Prats have MADE me prayerfully search the Scriptures to find out exactly what they really do say about the timing. It blesses my socks off when I have a 'eureka' moment. It taught me a passion for grammar I didn’t have before – still learning mind. I identified myself with my moniker so as to keep my 'edge' orf! I have a tendency to straight talking – saying it like I see it, trying to be honest and open, meaning no offence at all, but successfully offending everyone on every continent and island in this world and the next. ‘Here’ is teaching me what grace means and I am – trying - to toe the line! God bless you from Susan E.M. Jakeway (Mrs)Glos'shire,England. I no longer maintain that blog, Sue. Going back to read some of my writing makes me cringe with embarrassment. You cringe because you have grown past it. Others less 'grown' and are now where you were, will benefit from your earlier wisdom, I'll be bound! Billy, I would also have to agree with EI & Nathan on this! ...and then created us with that same spirit of creativity! Before I judge any new invention I always 1st think of Genesis 50:20, "But as for you, you thought evil against me; but God meant it unto good, to bring to pass, as it is this day, to save much people alive." God is very much on the Throne and has out-thunk us all! And wuts with the 8 line-spaces between "Hugs x" & 1?? I'm still trying to decipher that..
Ah! so you noticed the effects of the new technology. When I miss ya; and me mesmerising 'fluence don't work - I flicks channels, and a count down begins, not from 10, no that's the trick o it, it starts from my mark at 8. First I ave ta make me mark X, AFTER which I insert the 'Hugs' and the technology kicks in. When it gets ta number 1 - lo, and Behold! Ya find yerself desperate to come ere and comment thus re jigging the communicado! P.S. Yep! And it were Phil wot dun it. I was cunningly disguised as an old maid with me long handled, adjustable duster equipment - which holds a mini camera and recording device. I was secreted under the door curtain, but I was disturbed when the Footman stood on me foot and me long handled duster accidently shot up Phils trouser leg. It startled him somewhat, and although he managed to keep his composure, the Vindaloo Curry Harry had made him the previous night was fully fermented – so it got the better of im. It was what we Brits call a ‘carpet creeper – silent but deadly’! Me mini camera and recorder caught it all for posterity from its position up the trouser leg. It were a case of fully resplendent ‘son et lumiere’ PLUS it triggerd the Aroma and Vapour collector which was inflated to full capacity. This had the effect of fully extending Phil’s elasticised garter, thus rapidly releasing the metal fastener which catapulted from his trouser bottom JUST as the palace cat was winding itself around Phils leg; so basically, for all intents and purposes, Phil shot the cat. If it weren’t for young Harry finding it all highly amewsing to see the moggy sprawled on the balcony with the garter fastener trademark number severely marking the beast – no-one would ave noticed a thing! That DrNofog has done it again! He does his blue 'here', winds me up and when EI is fully sprung - he leaves me flat!